New clues found in the disappearance of 22 year old missing Paige Aiello, her purse, wallet and phone were found on the George Washington Bridge. Police are searching the waters near the GW. 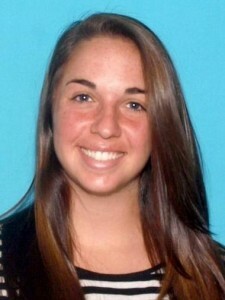 22 year old TCNJ college student Paige Aiello has been missing since Tuesday, April 9, 2013 in New Jersey. The Hillsboro, NJ resident, Paige Aiello has an on-campus apartment at TCNJ; however, according to family members has been staying at home recently. Her father drove her to class Tuesday morning and also drove her home around 1 PM. This was the last time she has been seen. When her mother returned home at 2:45 PM, Paige was gone and had taken her mother’s 2006 grey Audi A4 without permission, according to the Somerset County Prosecutor’s Office. The family reported her missing to Hillsborough police at 7:45 PM. The Audi A4 was found about 10: PM on Wednesday by the New Brunswick Police Department in the Gateway parking garage located on Somerset Street in New Brunswick, NJ. Paige Aiello was reported missing on Wednesday. At this time the police are saying they do not suspect foul play. Paige Aiello’s purse containing her car keys and mobile phone were found on the south walkway of the upper level of the George Washington Bridge by a passer-by at 8:30 p.m. on Wednesday, the prosecutor’s office said. The Good Samaritan who found the purse called the Aiellos and a search was launched in the Hudson River near the bridge, prosecutors said. Port Authority Police Department was assisted in the search by Harbor Patrol, the U.S. Coast Guard, New York Police Department Patrol and Aviation Units, prosecutors said. A Port Authority of NY/NJ spokesman said nothing was found in the water. An NYPD spokesman said today he did not believe the Harbor Patrol has returned to the area to resume the search. Anyone with information on her disappearance is asked to call the Hillsborough Township Police Department at (908) 369-4323, the Somerset County Prosecutor’s Office at (908) 575-3300, Somerset County Crime Stoppers’ Tip Line at (888) 577-TIPS(8477) or online at www.888577tips.org or www.scpo.net and click on either “Crime Stoppers” or “TIPS HOTLINE”.